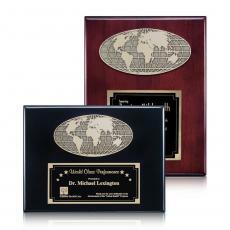 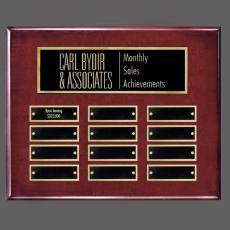 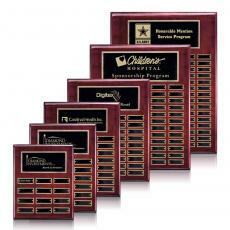 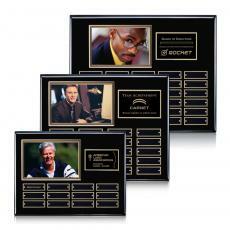 Perpetual plaques are also known as yearly plaques, monthly plaques or quarterly plaques. 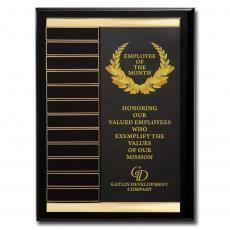 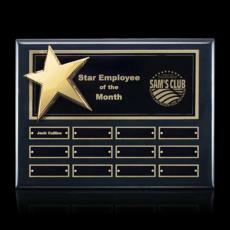 They are an excellent way to acknowledge the employee of the month or donors to your charity or to provide recognition for any ongoing project. 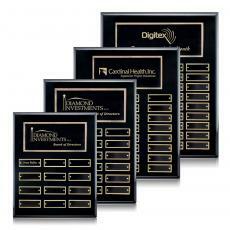 When using perpetual plaques as recognition awards, you have a large area at the top for the name of the award and why it is important to your group. 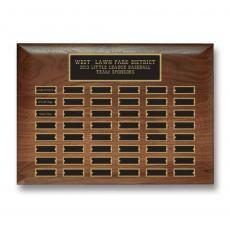 Below it, usually in two or three columns, are individual nameplates with the each person’s name and the date, added one at a time as they are recognized. 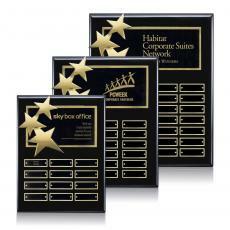 These are highly prized personalized awards because perpetual plaques are usually posted in a main hallway or lobby for everyone to see. 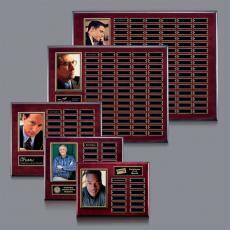 They are a constant reminder of excellence and the high esteem that the group feels toward those with their names on the plaque. 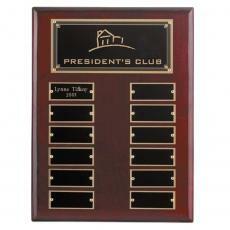 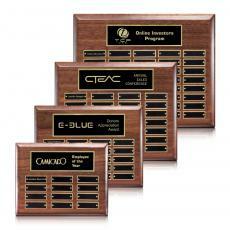 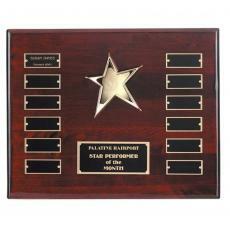 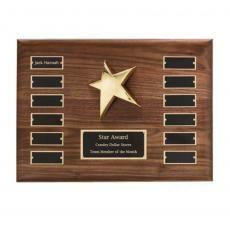 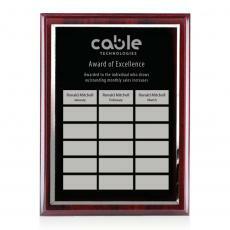 These engraved awards usually have a wood backing with individual brass plates for each name. 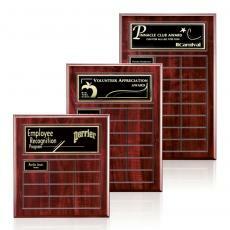 They come in a range of woods, including cherry and walnut. 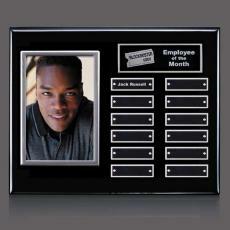 The plates can be screw-mounted, magnetic or permanent. 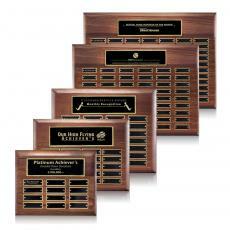 $155 - $265| Sizes: 10.5"x13", 12"x15" & 9"x12"
$95 - $145| Sizes: 12"x12.5", 12"x15.5" & 12"x18.5"
$155 - $745| Sizes: 10.5"x13", 12"x15", 16", 16"x20", 18"x24" & 9"x12"
$145 - $325| Sizes: 10.5"x13", 12"x15", 8"x10" & 9"x12"
$155 - $260| Sizes: 10.5"x13", 12"x15" & 9"x12"
$175 - $355| Sizes: 10.5"x13", 12"x15", 8"x10" & 9"x12"
$125 - $530| Sizes: 10.5"x13", 15"x21", 8"x10" & 9"x12"
$220 - $335| Sizes: 10.5"x13", 12"x15" & 9"x12"
$185 - $295| Sizes: 10.5"x13", 12"x15" & 9"x12"
$145 - $695| Sizes: 10.5"x13", 12"x15", 16"x20", 18"x24", 8"x10" & 9"x12"
$145 - $295| Sizes: 10.5"x13", 12"x15", 8"x10" & 9"x12"
$195 - $300| Sizes: 10.5"x13", 12"x15" & 9"x12"
$145 - $735| Sizes: 10.5"x13", 12"x15", 16"x20", 18"x24", 8"x10" & 9"x12"
$175 - $945| Sizes: 15"x11", 21"x15" & 22"x30"
$180 - $280| Sizes: 10.5"x13", 12"x15" & 16"x20"
$200 - $595| Sizes: 10.5"x13", 12"x15", 16"x20", 18"x24" & 9"x12"
$200 - $300| Sizes: 10.5"x13", 12"x15" & 9"x12"
$220 - $675| Sizes: 10.5"x13", 12"x15", 16"x20", 18"x24" & 9"x12"
$185 - $295| Sizes: 10.5"x13", 12"x15" & 9"x0.5"